truck driver and a talented basketball player. Combined to bat .262/.316/.458/.774 (143-546) with 23 HR, 36 2B, and 75 RBI in 147 G for NYM and PHI…the 36 2B ranked 10th in the N.L., and he tied a career high with 60 XBH (also 2011)…posted 2nd-most doubles, RBI, and total bases (250) of his career, as well as 3rd-best SLG…his 23 HR tied 2nd-highest figure in any season (25 in 2011)…had 19 go-ahead RBI, 2nd-most of his career, (26 in 2011)... posted 7 HR and 13 RBI in 18 G vs. Miami, most HR he has ever hit against one opponent in a season. basemen with 50+ RBI at the break…in final game w/ NYM on 7/26 at PIT, went 3-for-5 with 2 2B, HR, and 4 RBI, matching career high with 3 XBH (3rd time). Batted .228/.286/.392/.678 in 49 G for the Phillies to finish the season…18 of 39 hits w/ PHI were XBH…batted .324 (11-34) with RISP…played 9 G against the Mets after the trade…hit home runs in consecutive games 8/4-5 vs. MIA, his 1st 2 HR w/ PHI…recorded 1500th career hit on 8/7 at ARI, a double in the 8th inning off Jake Diekman…hit 5th career walk-off HR on 8/31 vs. CHC, a 10th-inning blast off Steve Cishek. Was on the 10-Day Disabled List from May 16 (retroactive to May 14) to May 25 and from June 13-23 with a sprained left thumb...Hit .307 (77-251) with 21 doubles, six home runs and 35 RBI in 72 games after the All-Star break... Batted .250 (57-228) with 11 doubles, eight home runs and 24 RBI in 63 games prior to the All-Star break...Batted .392 (49-125) vs. lefties, the second-best mark vs. lefties in the NL (min. 100 at-bats) behind Nolan Arenado (.420)...Was the third-best average vs. lefties in the majors (min. 100 at-bats) behind Arenado and Avisail Garcia (.424)...Led the Mets with 14 games of three or more hits...Over his final 34 games, Cabrera hit .366 (41-112) with 12 doubles, five homers, 24 RBI and 16 runs scored...The .366 average was sixth-best in the majors (and third-best in the NL) from August 25 through the end of the season (min. 100 plate appearances)...His .431 on-base percentage in that time was eighth-best in the majors while his 12 doubles were tied for fifth in the majors...In September, Cabrera batted .371 (33-89) with nine doubles, four homers and 17 RBI (27 games)...His .371 September average was third-best in the NL...Also ranks among the NL leaders during the month in doubles (nine, tied for second), slugging percentage (.607, fourth) and on-base percentage (.431, fourth)...Played 45 games at shortstop, 32 at second base and 44 at third base...Made first career start at third base on July 22 vs. Oakland...Batted .406 (28-69) with four home runs and 13 RBI in 17 games vs. the Phillies...Hit two homers on June 12 vs. the Cubs (both off John Lackey)...His sixth career multi-homer game...Had an 11-game hitting streak from September 4-17 where he batted .526 (20-38) with eight doubles, two homers and eight RBI...The 11-game streak is tied for the third-longest streak of his career...Delivered a two-run pinch-hit homer on September 17 at Atlanta...Was the second pinch-hit homer of his career...Hit a go-ahead, three-run homer in the 11th inning on September 30 at Philadelphia...Finished the game 4-6. Hit the second-most home runs he's hit in a single season in his career (23) in his first season with the Mets...His 23 home runs were the most since he hit 25 in 2011...His 62 RBI were his most in a single-season since driving in 64 runs in 2013 for Cleveland...The 23 home runs were seventh-most among major league shortstops (fourth-most among National League shortstops)...His 23 homers were also tied for the seventh-most by a switch hitter...The 22 homers as a shortstop (had one as a pinchhitter) set a Mets franchise record for home runs by a Mets shortstop in a single-season...Passed the 19 by José Reyes in 2006...Hit 18 home runs at Citi Field, second-most in a singleseason in Citi Field history...Trailed Lucas Duda's 19 Citi homers from 2015 for most in a single season...Was named the NL Player of the Week for the week of August 22-28, 2016, when he batted .545 (12-22) with a 1.136 slugging percentage, three home runs, eight RBI and a .583 on-base percentage...Was on the 15-Day Disabled List from August 2-19, with a strained patellar tendon in his left knee...Batted .345 (51-148) with 11 doubles, one triple, 10 home runs, 29 RBI, 23 runs scored and 16 walks in 41 games after returning from the Disabled List on August 19...The .345 average was tied for ninth-best in the NL in that time while his 29 RBI in that stretch were tied for the fifth-most in the NL.After going 0-32 with runners in scoring position from May 27-July 24, Cabrera batted .429 (15-35) with three home runs and 20 RBI with RISP from July 26-end of the season...Had a .986 fielding percentage (seven errors/511 total chances), fourth-best in the majors among shortstops (second-best among NL shortstops)...Homered twice in the Mets 10-2 win over the Cubs on July 1 at Citi Field...Was his first multihomer game since May 6, 2013 vs. Oakland while playing for Cleveland...Was the first Mets shortstop to hit two home runs in a game since José Reyes did so on September 27, 2011...Turned in his second multi-homer game of the season and the fifth of his career on August 26 vs. Philadelphia...Homered from both sides of the plate in his multi-homer game...Was the first Met to homer from both sides of the plate since Carlos Beltran did so on May 12, 2011 at Colorado and the 11th Met to do it overall...Is the first Met to homer from both sides of the plate at Citi Field...The last Met to do it in a home game was Tony Clark in August 2003 at Shea Stadium...Hit his first career pinch-hit homer on September 1 vs. Miami...Delivered a three-run, walk-off homer in the 11th inning on September 22 vs. Philadelphia...Was the fourth walk-off homer of his career and his seventh career walk-off RBI...The last Met to hit a walk-off homer when trailing in extra innings was Cliff Floyd, who did so on June 11, 2005 vs. Los Angeles-AL...Launched his third career grand slam on September 25 vs. Philadelphia. Was 1-3 with a walk in the NL Wild Card Game vs. San Francisco. Hit 15 home runs in his only season with Tampa Bay, the most since his most recent All-Star season in 2012...His 15 homers were tied for second-most for an AL shortstop with Marcus Semien of Oakland....Is one of three switch-hitters with at least 14 home runs in each of the last five years...Other two are Carlos Beltran and Carlos Santana....Led all AL shortstops with 48 extra-base hits....Batted .328 (67-204) in 57 games after the All-Star break with 10 home runs and 36 RBI...His batting average was eighth in the AL after being activated on July 28...Recorded his 1,000th career hit on May 13 vs. the Yankees...Collected his 500th career RBI on September 20 vs. Baltimore....Had 18 RBI during the month of September, the most for a month in his career since June, 2012 (20). Dealt from Cleveland to Washington at the July 31 trade deadline, ending an eight-year stay in the Indians organization...in a combined 146 games (140 starts; 92-SS, 48-2B) batted a career-low .241 (133-for-553) with 14 HR, 61 RBI, 31 2B and 10 SB...Helped the Nationals clinch the NL East title while being used as a second baseman, his first action there since 2009...despite his time away from the position, recorded a .995 fielding pct., with 1 error in 206 total chances...his career .994 fielding pct. at 2B ranks 1st among active players (min. 200 games)...Since 2011, ranks among major league switch-hitter leaders in HR (69, 6th), RBI (285, tied for 5th), doubles (133, 2nd) and hits (571, 6th)...over that span, his 69 HR rank 7th in the majors among middle infielders...Is one of two middle infielders to record at least 14 HR in each of the last four seasons (2011-14), along with Robinson Cano...is one of three switch-hitters to do so, along with Carlos Santana and Carlos Beltran...Made his seventh straight Opening Day start for Cleveland, and fifth straight at SS (started 2008-09 at 2B)...Hit a walk-off, 3-run homer on June 4 vs. BOS off Edward Mujica in the 12th inning, sealing a 7-4 victory...it was his third career walk-off HR...Enters the 2015 season 27 hits shy of 1,000 for his career...POSTSEASON: Started all 4 games of the NLDS vs. SF at 2B...in Game 1, hit a solo home run off Hunter Strickland in the 7 th inning, plating the final run of Washington's 3-2 loss. Rallied late in the season and once again ranked among American League shortstop leaders in home runs and RBI...Ranked 2nd among AL shortstops in HR (14) and 5th in RBI (60)...Over the last three seasons from 2011-13 his OPS has gone from .792/.762/.700 the last three years while his home run total have gone from 25/16/14...Season got off to a 6-for-51 (.118) start thru April 17 before hitting in a season-high 10 straight games from April 18-May 1 (.378, 9RBI) that jump started his season...From April 18 until going on the 15-day DL on June 4 he hit .299 (46-154) with 17 2B, 2 3B, 3HR & 22 RBI in 40 games...Placed on the 15-day Disabled List for the third time in his career on June 4 after being injured the night before in Yankee Stadium running out a ground ball, an injury that bothered him much of May...At the time of his DL stint he was T7th in the AL in triples (2), T12th in extra base hits (25) and tied for 4th in doubles (18)...Most of this stretch came in the 3-spot in the order, a position he hit .295 (46-156) in during the season...Came off the DL on June 26 and hit .204 and .221 in July and August, respectively...Indians were 43-10 (.811) when he scored a run...From Sept 7-thru end of season he hit .286 (24-77) with 5HR, 15RBI and 13 RS over the last 22 games of the season...Made 127 starts at shortstop and recorded a fielding pct of .982 (9E, 503TC), the 3rd-best fielding pct in the American League at SS (made just 1 error over his last 30 games)...Made 21 starts at clean-up from mid-July/mid-August, hitting .198 (16-81) with 2HR, 10RBI (.578OPS)...Enjoyed his third career two-homer game on May 6 vs. Oakland. Had a solid offensive campaign, earning a second straight All-Star selection, the first by an Indians shortstop since Omar Vizquel in 1998-99...At the time of his July 1 All-Star selection he ranked 10th in the AL in on-base pct (.379)...Led American League shortstops in OPS (.765) and slugging pct (.425), making 133 starts at shortstop and 6 starts at DH...Finished tied for 16th in the AL in doubles (35) and was 3rd on the club in multi-hit games (45)...Hit 2nd or 3rd in the lineup in every start this season, hitting .293 (56-191) when batting third. Also ranked 2nd in the AL in HR by a shortstop, T1st in doubles and 3rd in RBI...Hit in a season-high 12 straight games from May 25-June 10 and for the season hit .300 (72-240) with runners on base, tops on the club...Recorded his 5th career walk-off hit/2nd career game-ending home run on June 19 vs. the Cincinnati Reds and Aroldis Chapman...His 5 steals of third base were tied for 9th in the AL...Signed a two-year extension thru the 2014 season on April 4. Recorded a season fielding pct of .971 in 136 games at shortstop (19E, 650TC, 11th in AL)...Suffered thru first career 3-error game on June 17 vs. Pittsburgh which snapped a 32-game errorless streak...Over his last 82 games made 17 errors at SS after June 16...Hit .286 (87-304) in the first half with 42RBI (.832OPS) and .251 (63-251) in the second half with 26RBI (67G, .676OPS)...Hit a combined .233 (49-210) in July/August with 13RBI in 53 games before hitting .300 (15-50) over his last 13 games (10RS, 2HR, 11RBI) from Sept 16-thru the end of the season...Was bothered much of the last month of the season with right wrist/hand soreness that limited him to 22 games for the month...Appeared in 11 games for Caracas in the VZ Winter League in 2012 off-season. Had a breakout season earning his first All-Star selection and led the team with new career-highs in virtually every major offensive category including hits, runs, doubles, HR, RBI, games and OPS...Among American League leaders he finished 17th in RBI (92), T15th in hits (165), T16th in runs (87), 16th in total bases (278), T21st in doubles (32) and T21st in HR (25)...After the season was named the shortstop on the Sporting News AL post-season All-Star Team and became the first Indians shortstop to win a Silver Slugger Award since being founded in 1980...Was 20th in the AL MVP voting (4 pts) and after the season was named Man of the Year by the Cleveland BBWAA Chapter...Led AL shortstops in RBI, was T1st in hits and was second in runs, doubles and HR... His 25HR were the highest single-season total in club historyby a shortstop as he had 18 career HR heading into 2011 (broke Jhonny Peralta's 2005 mark of 24)...Also set a single-season home run mark for Venezuelan-born shortstops...Most RBI by an Indians shortstop since Lou Boudreau drove in 106 in 1948 while winning the AL MVP Award...His 22HR increase from 3 in 2010 to 25 in 2011 was the 2nd largest in club history over consecutive seasons (Ed Morgan went from 3 to 26 in 1929-30)...Hit .262 (28-107) w/4 2B, 5HR & 17RBI in 26 April games after having 1HR/3RBI in April 2010...Exceeded his 2010 RBI total of 29 in the 44th game of the season...Hit .330 (35-106) in May with 7 2B, 5HR & 19RBI (.947OPS)...Overall hit .293 (105-358) in the first half with 22 2B, 14HR & 51RBI in 88 games (.836OPS)...Struggled somewhat in the 2nd half as fatigue set in, hitting .244 (60-246) with a .729 OPS and 41RBI in 63 games...Rebounded over last 8 games of the season from Sept 17th -on, hitting at a .406 (13-32) clip with 3HR & 10RBI...Made 151 starts at shortstop and finished 6th in the American League in fielding % at shortstop (617TC, 15E) and finished the season with 1 error in his last 34 games...Also unofficially led MLB in "WebGems" according to ESPN (13)...Enjoyed a pair of 2-homer games this season (8/1 @BOS; 5/22 vCIN), the first multi-homer games of his career...On May 22 vs. the Reds he went 5-for-5 with 2HR, 5RBI and a steal, becoming just the second SS since 1920 w/5 hits, 2HR & 5RBI in a single game... Set new single-game career-highs in hits/HR and equaled career-high in RBI...Also drove in 5 runs on Sept. 22 vs. CWS, his second 5RBI game of the season...Was very good in the clutch this year hitting .325 (79-243) with runners on base (10th best in AL) and .309 (43-139) with RISP (18th best in AL)...32 of his 92RBI either tied the game or gave the Indians the lead...147 of his 151 starts on the year came in either the second (78GS) or third (69GS) spot in the lineup....Hit .299 (96-321) when batting 2nd (.876OPS)...His .636 (7 for 11) average with bases loaded was best in the AL. Had a good season in his 3rd full year at the Major League level despite missing 2 months with a broken left forearmsuffered in mid-May...Appeared in 95 games at shortstop, making 94 starts and compiling a steady fielding % of .972(11E, 431TC)...Equaled a career high (7th time) with 4 hits on April 27 at the LA Angels....Suffered broken left forearm diving up the middle in Tampa Bay on May 17, colliding with 3B Jhonny Peralta in a shiftsituation...Placed on the DL the next day and was shelved for two months before being activated on July 19 after arehab stint in Mahoning Valley and Akron...Before being activated he was hitting .287 (39-136) in 33 games...Uponactivation he hit .269 (66-245) with 23 runs, 10 2B, 2HR & 22RBI in 63 games....Hit a walk-off homer on August 28 vs. KC off Jesse Chavez, his final HR of the season...Also had game-winning hiton May 1 vs. Minnesota...Reached base safely in 73 of 96 games via hit or walk...Finished the season by hitting .272(34-125) from August 25-on and over his last 8 games he was 13 for 31 w/5RBI (.419)...Was tied for 7th in the AL with11 sac bunts...Hit in 9 straight games from August 10-19....Hit .340 (49-144) with runners on base and .325 (13-40) with RISP-2outs...Hit .278 (40-144) when batting first in theorder (35x)....Was 6th in the AL in batting average with runners on base, T9th w/21 bunts in play, 4th in batting avgwith RISP (.342) and 20th in lead-off batting average (.316). Turned in an outstanding season offensively and defensively, opening the season at second base before becoming the full-time shortstop in May...Compiled career-highs in virtually every offensive category as he finished 11th in the American League in batting average (.308) and 11th in doubles (42)...Was also T8th in with 10 sacrifice bunts...Finished tied for 1st among American League shortstops with 36 doubles (O Cabrera) and 3rd in on-base+slugging percentage (.797) and 4th in batting average (.307)...Scored a career-high 4 runs on May 14 at Tampa Bay to go along with 2 RBI and 4 hits...Had five 4-hit games on the year, the last coming on Sept. 27 vs. BAL...First career-grand slam and career-high 5 RBI on April 18 vs. NYY (slam off Claggett)...Was on the disabled list from June 3-27 with a left shoulder subluxation after being injured in play at second base on June 2 at Minnesota...After the activation he hit .303 (96-317) with 29 2B, 4 HR & 41 RBI in 78 games...Career long 12 game hitting streak from August 5-18 (.429, 21-49, 5RBI) and reached base safely in 21 straight games in August...From August 1 thru the end of the season he hit .325 (67-206) with 18 2B, 2HR & 27 RBI in 52 games...Stole 17 bases in 21 attempts (81%)...Made 28 starts at second base (28G) and 99 starts at shortstop (100G)...Combined fielding percentage on the year was .983 (582TC, 10E)...Compiled a fielding percentage of .980 (440TC, 9E) at shortstop, which would have been 5th in the AL with the required amount of games played at the position...Reached base safely via hit or walk in 105 of 131 games...Hit .311 (78-251) when batting 2nd, .343 (82-239) with runners on base, .295 (38-129) with RISP...The .343 average with runners on base was 4th best in the AL...His 81% SB percentage was t15th best in the AL...Also finished among AL leaders in bunts in play (20, t10th), average vs. RHP (.309, 16th), road batting average (.320, 9th) and multi-hit games (51, T17th)...Entered the season with a .239 career average vs. RHP...Hit .311 (78-251) when batting 2nd...Underwent a right elbow arthroscopy on October 7 at the Cleveland Clinic (Dr. Schickendantz) to remove loose bodies from the elbow. Season was turned around after a productive 4-week stint in Buffalo in June and July that raised his battingaverage 75 points from .184 at the time of his option to end the season at .259...Was the club's opening daystarter vs. Chicago, but never gained an offensive footingas he hit .211 (16-76) in April, .169 (11-65) in May & .154(2-13) in June before being optioned to AAA Buffalo onJune 9...At the time of his option he was hitting .184 (29-158) w/a HR & 14RBI in 51 games (.282 OB%, .247SLG,.529OPS)...Hit .326 (46-141) at Buffalo with 4HR & 13RBI in 34 gameat AAA and was International League Batter of Week fromJuly 7-13....Had 16 multi-hit games of 34 at Buffalo and at one point had three straight 3-hit games and two different streaks of four consecutive multi-hit games (6/12-15,7/7-9)...At Buffalo he hit .337 (31-92) off RHP and .306 (15-49) off LHP...Recalled to Cleveland to start the 2nd half on July 18 and hit .320 (62-194) in the second half w/13 2B, 3HR& 33 RBI in 61 games (.398OB, .464SLG, .862OPS) ...From August 9 thru the end of the season he hit .356(48-135) with 10 2B, 3HR & 29 RBI (43G, .424OB%, .920OPS)...His September average of .416 (32-77) wasthe highest mark in the entire American League (6 2B, 2HR, 22RBI, 24G)...His 22 RBI were T7th in the AL inSeptember and was under consideration for AL Player of the Month honors...On the year he made 87 starts at second base (94G) and 18 starts at third base (43G)...Recorded a combinedfielding % of .976 (9E, 373TC) between the two positions...Recorded the 14th unassisted triple play in MajorLeague history on May 12 vs. Toronto (game 2) after a Lyle Overbay lineout to him on a double steal...Was named co-American League Player of the Week, Sept. 9-14 (.4455, 10-22, HR, 8RBI) with MIN OF CarlosGomez...Enjoyed a career-high 4 hits on July 30 vs. Detroit...His 11 sac bunts were 2nd in the AL...Wassuspended for 3 games, Sept. 23-25, for his actions in a fight with Detroit on Sept. 19...OPS when hitting right-handed was .957 compared to .638 when hitting lefty...Hit .397 (27-68) with runnerson and 2 outs and .367 (18-49) with RISP-2outs...Hit .365 (23-63) when playing shortstop and .290 (69-238)when batting 9th. Was impressive over the last 7 weeks of the season, earning a starting role at second base and his move tothe #2 spot in the order behind Grady Sizemore on August 25 proved to be on one of the pivotal moves of theseason ... Indians were 28-12 (.700) when he started and 24-6 (.800) when he started in the #2 hole in theorder... Contract was purchased from AAA Buffalo on August 7 and made his ML debut the next night inChicago-AL... Overall made 40 starts at second base (34G), 6 starts at shortstop (7G) and appeared in 1game at third base... Made 1 error in 220 chances between the 3 positions ...Collected first hit on August 11vs. NVY (Mussina) and hit first HR on 8/18 at Tampa Bay (Hammel)... Collected a season/career-high 3 hitstwo times (last 9/10 @CWS)... Reached base safely in 370f 43 games ... Had an 11-game hitting streak fromSept. 1-12... Hit .283 (34-120) when batting 2nd and .289 (22-76) with runners on base...MINORS - Cabrerabegan the year at Akron where he hit .310 (114-368) with 23 2B, 3 3B, 8HR and 54 RBI in 96 games (alsostole 23 bases in 30 attempts and scored 78 runs) ...At the time of his July 30 promotion to Buffalo he wasleading the Eastern League in runs scored and was 4th in both hits and stolen bases. He hit .336 (51-152)with runners on base and .323 (92-285) off RHP at Double-A while posting hitting streaks of 12 and 13games ... Named Indians Minor League Player of the Year by USA Today and likely to win the Lou Boudreauaward as the club's Minor League Player of the Year. ..At AAA Buffalo he hit .316 (12-38) with 3 2B & 3RBI in 9 games. Overall on the year between Akron/Buffalo he hit .310 (126-406) with 26 2B, 8HR & 57 RBI in 105games ... Combined on the year scored 114 runs ... In the PO system he ranked 5th in SB (25) and 4th in battingaverage (.310). Began the year at AAA Tacoma where he hit .236 (48-203) with 27 runs scored, 12 2B, two 3B, three HR and 22 RBI in 60games with AAA Tacoma...Reached base in 14 consecutive games from April 6-May 3...Cabrera made his firsterror of the season on May 30 after playing 36 straight games (165 TC) at shortstop without an error...At thetime of the trade he was first among all shortstops in the Pacific Coast League with a .986 fielding percentage(4 E/291 TC)...Was on the disabled list from April 12-25 with a sprained right ankle...Was the youngest playerin the PCL (20)... Assigned to AAA Buffalo where he hit .296 (32-108) with 20 RS, six 2B, one HR and 10 RBI in 28 games from July 30through the end of the season...Made 14 errors in 52 games at short with the Bisons...With Buffalo he hit .288(38-132) vs. RHP and .167 (2-23) with RISP...Played winter ball for Lara in the Venezuela after the season. 2005 Started the season with Wisconsin of the Midwest League and finished the season with six games atAAA Tacoma in his first full professional season at the age of 19...Hit .321 (36-112) in May and .396 (19-48)off LHP...Promoted to Inland Empire of the California League on 6/22...Had a season-high four hits on 8/1 atLancaster...Ended the season with six games in Tacoma beginning on 8/31. Named to the Northwest League midseason and postseason all-star teams at A Everett...Hit .358(24-67) with RISP. 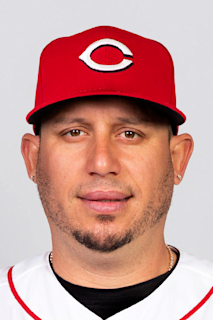 January 24, 2019 Texas Rangers signed free agent 2B Asdrubal Cabrera. October 29, 2018 2B Asdrubal Cabrera elected free agency. July 28, 2018 Philadelphia Phillies activated 2B Asdrubal Cabrera. July 27, 2018 New York Mets traded 2B Asdrubal Cabrera to Philadelphia Phillies for RHP Franklyn Kilome. June 23, 2017 New York Mets activated 2B Asdrubal Cabrera from the 10-day disabled list. June 20, 2017 New York Mets sent SS Asdrubal Cabrera on a rehab assignment to St. Lucie Mets. June 13, 2017 New York Mets placed SS Asdrubal Cabrera on the 10-day disabled list. Left thumb sprain. May 25, 2017 New York Mets activated SS Asdrubal Cabrera from the 10-day disabled list. May 23, 2017 New York Mets sent SS Asdrubal Cabrera on a rehab assignment to Binghamton Rumble Ponies. May 16, 2017 New York Mets placed SS Asdrubal Cabrera on the 10-day disabled list retroactive to May 14, 2017. Sprained left thumb. December 13, 2016 SS Asdrubal Cabrera assigned to Leones del Caracas. August 19, 2016 New York Mets activated SS Asdrubal Cabrera from the 15-day disabled list. August 16, 2016 New York Mets sent SS Asdrubal Cabrera on a rehab assignment to St. Lucie Mets. August 10, 2016 SS Asdrubal Cabrera assigned to St. Lucie Mets. August 2, 2016 New York Mets placed SS Asdrubal Cabrera on the 15-day disabled list retroactive to August 1, 2016. Strained patella tendon in his left knee. December 11, 2015 New York Mets signed free agent SS Asdrubal Cabrera. December 4, 2015 SS Asdrubal Cabrera assigned to Leones del Caracas. November 2, 2015 SS Asdrubal Cabrera elected free agency. July 28, 2015 Tampa Bay Rays activated SS Asdrubal Cabrera from the 15-day disabled list. July 12, 2015 Tampa Bay Rays placed SS Asdrubal Cabrera on the 15-day disabled list. Strained right hamstring. January 10, 2015 Tampa Bay Rays signed free agent SS Asdrubal Cabrera. October 30, 2014 2B Asdrubal Cabrera elected free agency. August 1, 2014 Washington Nationals activated 2B Asdrubal Cabrera. July 31, 2014 Cleveland Indians traded SS Asdrubal Cabrera and cash to Washington Nationals for 2B Zach Walters. June 26, 2013 Cleveland Indians activated SS Asdrubal Cabrera from the 15-day disabled list. June 4, 2013 Cleveland Indians placed SS Asdrubal Cabrera on the 15-day disabled list. Right quadriceps strain. October 11, 2012 SS Asdrubal Cabrera assigned to Leones del Caracas. April 23, 2012 Cleveland Indians activated SS Asdrubal Cabrera from the bereavement list. April 16, 2012 Cleveland Indians placed SS Asdrubal Cabrera on the bereavement list. October 8, 2010 SS Asdrubal Cabrera assigned to Leones del Caracas. July 20, 2010 Cleveland Indians activated SS Asdrubal Cabrera from the 60-day disabled list. July 14, 2010 Mahoning Valley Scrappers sent SS Asdrubal Cabrera on a rehab assignment to Akron Aeros. July 12, 2010 Asdrubal Cabrera assigned to Mahoning Valley Scrappers from Cleveland Indians. May 19, 2010 Cleveland Indians transferred SS Asdrubal Cabrera from the 15-day disabled list to the 60-day disabled list. May 18, 2010 Cleveland Indians placed SS Asdrubal Cabrera on the 15-day disabled list. Fractured left forearm. June 28, 2009 Cleveland Indians activated SS Asdrubal Cabrera from the 15-day disabled list. June 23, 2009 Cleveland Indians sent SS Asdrubal Cabrera on a rehab assignment to Akron Aeros. June 3, 2009 Cleveland Indians placed 2B Asdrubal Cabrera on the 15-day disabled list. Sprained left shoulder.